A grove of twelve American chestnut (Castanea dentata) trees was planted by the Skaneateles Conservation Area advisory committee in early in the 2000’s. A few of them were thriving well enough to produce fruit and nuts when when the picture below was taken in 2012, but most had died back. A few of those that have died are still sending up root sprouts. American chestnut (Castanea dentata), planted at the Skaneateles Conservation Area (Federal Farm) around 2004. Photographed 26 June 2012. In the spring of 2013, 20 bare-root American chestnut seedlings from The American Chestnut Foundation (TACF) were planted in an adjacent area. These were planted a little late in the season because of frozen ground, and the roots had been allowed to dry out a bit. But they all survived, with some die-back of the above ground portions. The original trees from around 2003 or 2004 had been planted in 5-ft. plastic shelter tubes to promote growth rate and protect them from deer and other predators. These were allowed to remain on the few surviving trees until the spring of 2014, when they were removed. It was thought that some of the problems with the original group of trees were the result of using shelter tubes that were too tall to begin with (causing moisture and heat problems) and then were left in place too long (causing tree trunks that were too tall and thin, and unable to support themselves). TACF now recommends that much shorter shelters be used (no higher than 2 feet), with wire cages or fencing used to protect the above-tube portion from herbivores. So the trees planted in 2013 had 18- or 24-inch tubes and 4-ft.-high x 3ft.-diameter cylinders of fencing. These were doing fairly well as of the 2014 growing season. 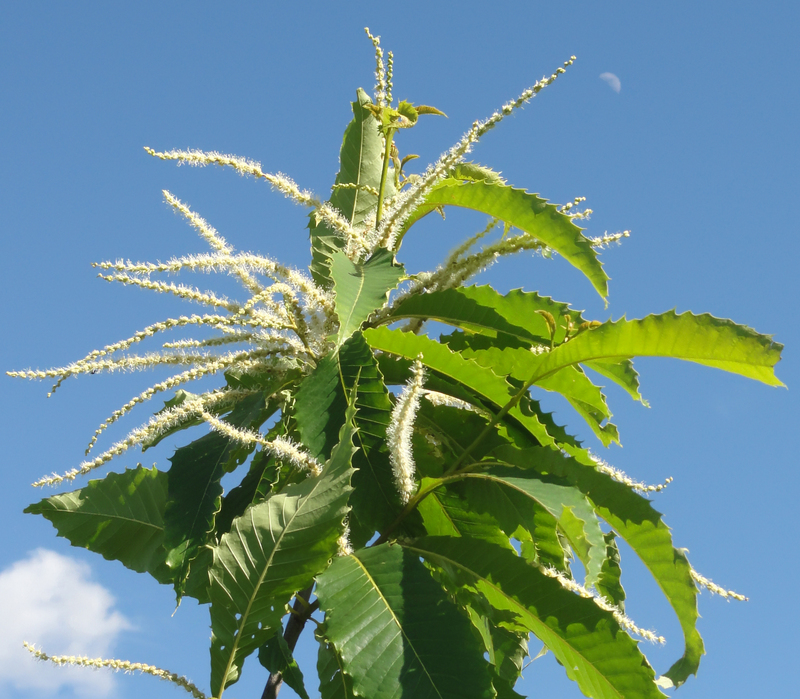 It should be pointed out that most American chestnut trees available to the general public, including our trees, are unlikely to be resistant to the chestnut blight (Cryphonectria parasitica), which has plagued American chestnuts since around 1900. But researchers at the SUNY College of Environmental Science and Forestry (ESF) have now developed blight resistant chestnuts, the seeds of which are projected to be made available to selected New York members of TACF in three to five years. To prepare for planting these blight resistant trees, in February of 2015, we are scheduled to receive non-resistant seeds and seedlings to plant “mother” trees apart from our current chestnut orchard, and far enough from each other that they are unlikely to pollinate one-another (chestnuts are self-sterile). It will take about eight years for these mother trees to start producing female flowers (burs). In the mean time, we hopefully will have received and planted some blight-resistant seeds near the mother trees. It takes only about five years for male flowers to be produced, so with perfect timing we could be planting blight resistant trees from our own seeds in eight to ten years. See Revision to Planting Mother Trees for Two-Tree Orchards for the latest recommendation on planting mother trees. Another important consideration is the soil type. USDA soil surveys seem to indicate that the soil in the open, sunny areas of the conservation area is somewhat alkaline and loamy, and experience has shown that it is often somewhat wet. The TACF Fact Sheet for Growing Chestnuts states up front: “Well drained soil is VERY important. Dry, sandy or gravelly soils are best and loamy soils are good. Avoid clay soils or those that retain water”. So the soil should be tested, at least for pH, before planting. These American chestnut photographs were taken at the Skaneateles Conservation Area on Old Seneca Turnpike in 2012.